Mr & Mrs Blog: Holiday Crafts! This year I have been into making Christmas wreaths! They are soo much cheaper nowadays to make then to buy. It is pretty amazing.. PLUS you are able to bring out your personality the way you want it! So far I have made two wreaths but I plan on making two more.. ha ha! 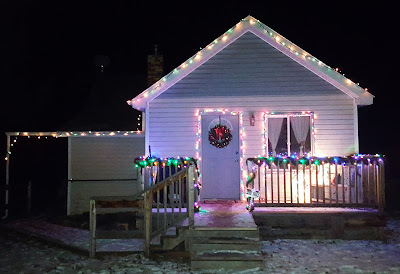 (This is why the Christmas house tour isn't up yet.. been waiting on my last wreaths to go up.. ALSO, been waiting on this puzzle we are working on to be done... SORRY!) 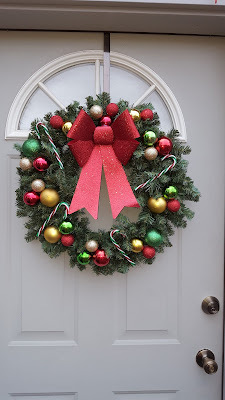 But any-who, for today's blog post I thought it would be fun to show you the two wreaths I have made, where I got the supplies, how much they cost to make and of course what you need to make them! Hope you enjoy! 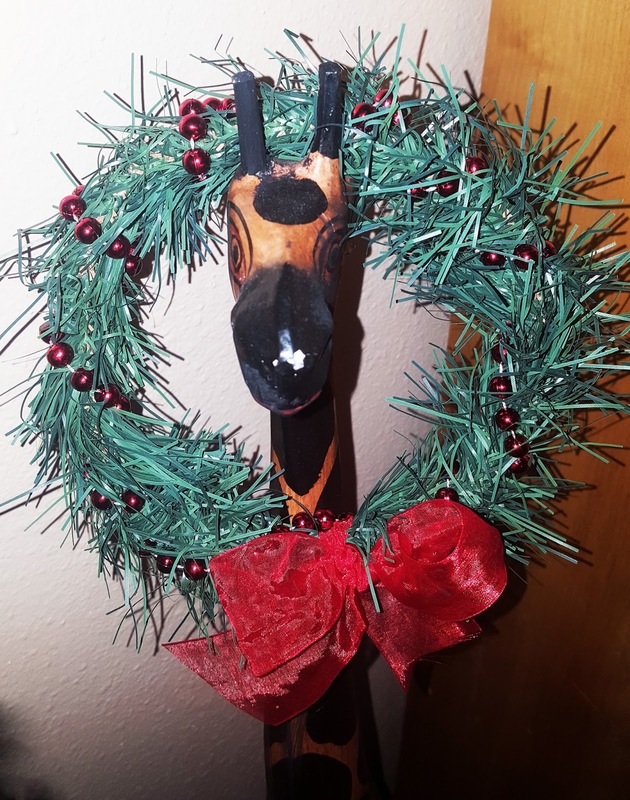 The first wreath I made just because I didn't want to have to put my giraffe away, so I figured if I put a wreath on him it made it Christmasy enough that I could leave Mr. Giraffe out. I took a garland that I got at the Dollar Store and cut it to the size I wanted. Once it was cut I put it into a circle and hooked it together. Next I took some red "berry" beads that I got at Walmart for $1.50 and measured out how much I would need to wrap around the garland. Once I had the garland into a wreath and the beads around I tied a bow with some red tulle ribbon that I also got at the Dollar Store. I though the bow really completed the cute but simple look of the wreath! 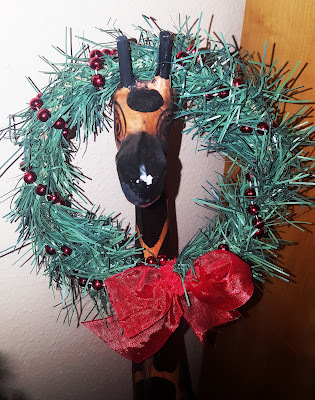 The grand total for this wreath was only $3.50! The next wreath I made was for our front door! Because our old one I ended up hanging inside this year. (You'll see in the Christmas house tour where it is!) I decided to keep it simple but cute! *side story! * Before I glued everything on I sent a picture to my sister to get her opinion. Well my darling niece said, "looks like Aunt Chelsey has been crafting again!" She knows me so well.. ha ha! Anyways! I got the green wreath already made for $5.00 at Hobby Lobby! Next I added a few candy canes that I also purchased at the Dollar Store to add a little bit more fun to the wreath! Lastly, I added a giant sparkly bow which was also purchased at the Dollar store! I just hot glued everything one and WA-la I had my wreath! 3 packages of Christmas ornaments in different sizes! I got mine at the Dollar Store but I am sure you can get them in many places! 1 giant bow, again I got my bow at the Dollar Store but I am sure you can get them anywhere! The grand total to make this wreath is.... drum roll please... $10.00!! What a steal of a deal if I do say so myself! Well, there you have it! My easy DIY wreath projects! Sure hope you enjoyed. 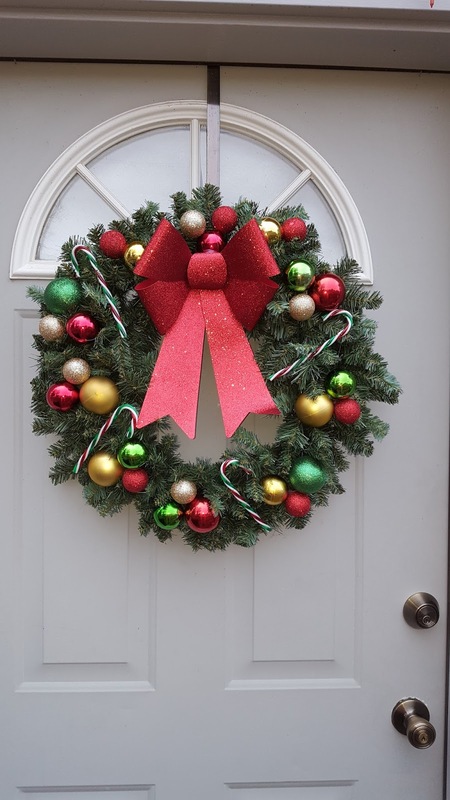 If you make either of these wreaths or any wreath please share a picture of yours! I'd love to see it. 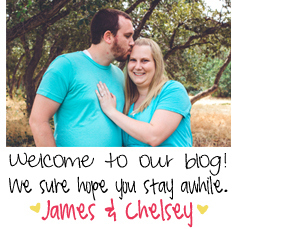 Make sure to subscribe to the blog on the right (by email or Google!) and leave a comment below what fun holiday DIY projects you're doing this year! PS.. here's a little peek at our home! Also, I promise you that the house tour WILL be up NEXT week!! So stay tuned. I'm so excited for you all to see how our home is decorated this year. Have You Heard The Word On The Street?